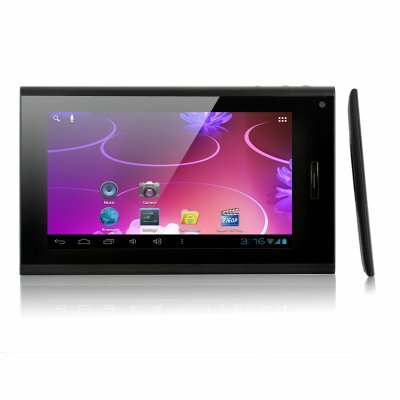 Successfully Added 3G Android 4.0 Tablet PC "Onyx" - 7 Inch Display, WiFi, 1GHz CPU, Phone Function to your Shopping Cart. 7 inch Android 4.0 Tablet PC with 3G connection to the internet via SIM card, additional connection to the internet via WiFi, a high speed 1GHz CPU and more! Welcome to the "Onyx" Android 4.0 tablet with 3G connection to the internet! If you are a fan of internet browsing on your tablet (and who isn't) then you know the pain of not being able to connect whenever you want to. Now with the "Onyx", just slip in your choice of WCDMA 850/2100MHZ SIM card and browse away. If that was not enough, add in a high speed 1GHz CPU as well as 1GB of RAM for not only using the Android 4.0 platform seamlessly, but allowing all your apps and functions to run at high speed, and you got a Android tablet PC that can do it all and do it in style. Other great features for the "Oynx" include a built in microphone for making phone calls as well as surfing the net with your 3G SIM card, great battery life under continuous use of up to 4 hours when internet surfing, using a 3G data network, playing games, sending emails and more, a front facing camera for quick pictures of you or your friends as well as being able to chat with people on Skype, 8GB of internal memory as well as Micro SD card slot taking up to 32GB external memory for storing all your media, apps, and games, and so much more! Available in our warehouse now, this ‘Onyx’ 7 Inch Android 4.0 Tablet is a must have for any gadget lovers and best of all, it’s brought to you at a factory-direct price that can't be matched. Available in our warehouse now, it is ready for immediate shipment to you or your customer. Guaranteed to be the next hot item in your online store, order now before everyone has one and make a nice profit for yourself. Brought to you by Chinavasion, the leader in wholesale Android tablets and Android devices.